Are you getting ready for the arrival of your little one and are wondering what kind of chair you need in the nursery? There are so many different chairs on the market and they all have something different to offer. You need to find the perfect one, so you can enjoy every minute while rocking your bundle of joy. 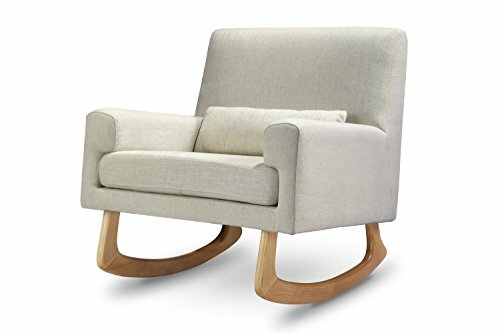 In this guide we will help you figure out exactly what you need to look for when buying the best glider or rocker for your nursery. Use the links above to check the latest prices or read our in-depth nursery glider reviews below. Why Is Nursery Seating Necessary? You are going to want nursery seating because you will spend a lot of your time in the nursery with your baby. Whether it is for feedings, book readings, or rocking to sleep, it is important you find a nursery chair you are comfortable in. Nursery seating is also a plus because babies find the back and forth motion of rocking to be very soothing. This means a rocking chair is one solution to getting your baby to fall asleep — every parent’s mission! Your nursery chair is going to be a decent investment so you should make sure it has several qualities, not just visual appeal. 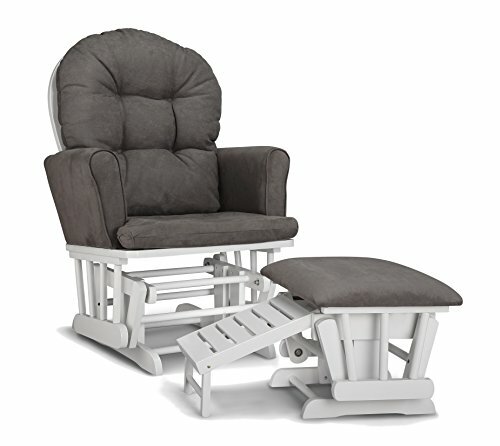 Comfort: Your glider or rocker should be supportive as well as comfortable. Be on the lookout for a chair that is high enough for you to rest your head. You will love that aspect during those late-night feedings. Good Reviews: If you are buying a chair you aren’t going to see in person before purchasing, it is important you read the firsthand reviews. Chances are the people leaving the reviews probably wanted similar features to the ones you want. Their judgment is important. Cost Effective: Nursery gliders and rockers can range from affordable to just downright crazy in price. You need to create a budget before you begin looking at chairs, and only limit your search to ones within your budget. Construction: Make sure your chair is going to stick around for the long run. A nursery chair should be built well enough that it can last for all your future babies. Easy Entrance: You want to make sure the chair is easy to get in and out of. Nothing is worse than startling a sleeping baby because you are struggling to get up out of a chair. Easy to Clean: Babies and messes go hand in hand, so it is important to have a chair that can be easily cleaned. Some chairs even come with a removable, washable chair cover (source). Accommodating Arm Rests: Your arms are going to need all the comfort when it comes to holding and supporting your baby. A chair with well-padded armrests or even wide arms, is a life-saver. Is it Safe: You want to make sure your chair is well-constructed and no moving parts are visible. Some new chairs have locks that hinder the rocking motion. This is a great feature to prevent pinching little fingers. Quiet: Some chairs tend to have a loud sound when rocking. It is important you find a chair that is a silent rocker or does not squeak. Although style and coordination are important, you are going to prefer the comfort of your nursery chair much more during those late night feedings rather than how well your chair matches the nursery. You need to start your journey of finding nursery seating by making a list of what items are most important for you to have in a chair, what you will be using the chair for the most, and what your determined budget is. You should list your must-have features in order of necessity — that way if you have to eliminate one, you can start from the bottom. There are so many features out there that it can be overwhelming, so having a predetermined list can make the buying process much easier and quicker. 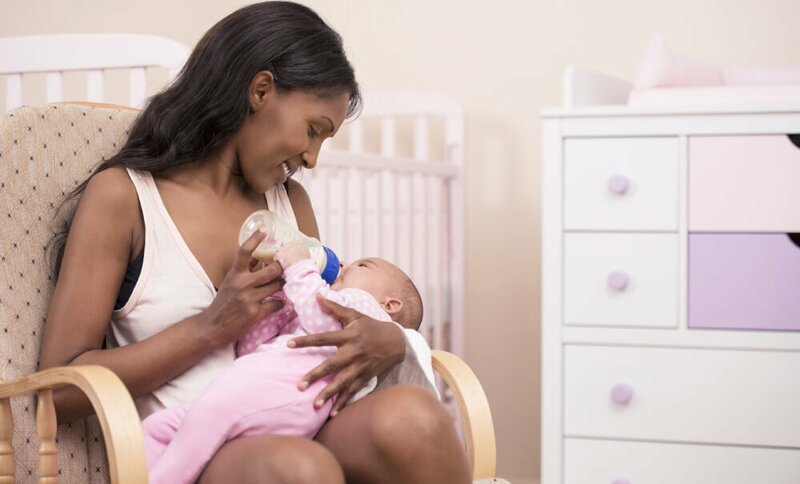 Some moms choose to breastfeed in the nursery chair, so if this is something you are considering, you need to be sure to look for chairs with special breastfeeding adaptations. There are so many different styles of chairs on the markets as well, so you should also keep in mind the features you would want with these. Now that you are more familiar with some of the key features associated with nursery seating and some of the safety issues to look out for, here are 10 of the best brands currently on the market. 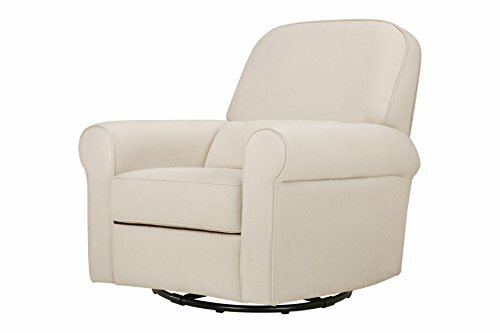 If you are a shorter mom looking for a chair with great support, this glider is a perfect option. It sits lower to the ground and has a supportive lumbar section to ensure maximum support. 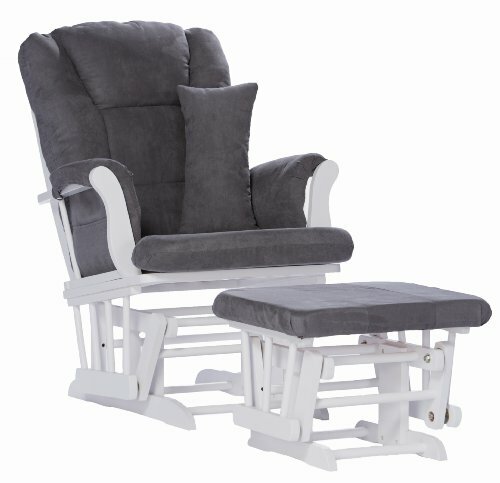 This glider also swivels, so if you need to turn to access something in the nursery or an object to help you stand up out of the seat, you will have that capability. This chair is delivered already assembled, so it is an easy addition if you are looking for a last-minute purchase for your nursery. The swivel part is designed to be safe for all fingers, with the majority of the swivel construction being hidden underneath the chair and not accessible by children. The material that comprises this chair is also free of chemical flame retardants and formaldehyde. This chair is thoughtfully designed to meet all of the needs of mom and baby during feeding time. Swivels smoothly in 360 degrees. Has lumbar support and additional head/neck support. Some buyers said their chair began to make noises with each rock. If you plan to spend a good amount of time in your glider breastfeeding, reading, or just hanging out with your baby, you'll want to look for extra padding, the ability to swivel and recline. This nursery chair is good for those parents looking for a universal chair. This one really has almost everything a nursery chair could offer. It is hard to come across a chair that contains all the features this one does. Not only does this chair swivel 360-degrees and have seamless gliding capabilities, but it also reclines. If you are looking for a chair that can accommodate any time of day and any comfort level, this is perfect. The supportive spring core foam-filled seat offers you extreme comfort and support. This chair is unlike many nursery chairs in that it has intricate designs on the back rest, which makes this a fashionable addition to any nursery. 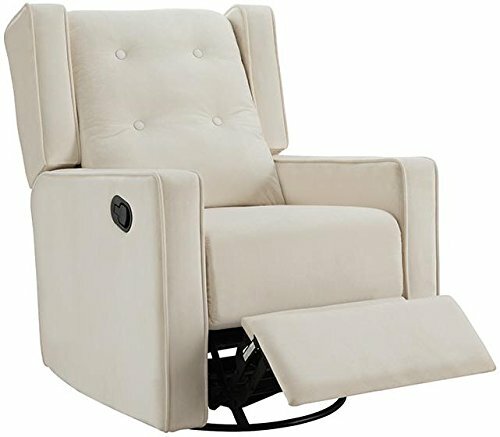 If you aren’t quite sure what features you want in your nursery chair, this is a great one to choose because you have the options of gliding, swiveling, or reclining. Reclines and swivels for maximum comfort. Maximum weight capacity 225 pounds. Sometimes a glider can seem to cost you an arm and a leg, but you don’t have to spend your monthly mortgage purchasing a chair. There are numerous budget gliders that still offer comfort and support without the high price. If you are looking for a great glider that won’t break the bank, this is a good selection. This glider is not only affordable, but it also looks the part. You can sit in this stylish glider all while being comfortable because there is extensive cushioning all along the chair. The armrests are also covered with padding, so your arms won’t begin to hurt when rocking your baby. The enclosed metal bearings allow for smooth gliding that will help you soothe your little one to sleep. The glider and ottoman pieces have solid wood frames to maximize stability. The additional ottoman is a great bonus because it can help take some of the stress off your back, and it also rocks with your chair so you don’t have to disrupt your rocking. There are several color options to choose from, so you should be sure to find one that aligns with your vision. Material can be spot cleaned, but not machine washed. Some buyers questioned the chair durability. Some buyers noted the chair squeaks when rocking. There’s so much to do when preparing for a baby. Make life just a little bit easier with this easy-to-assemble rocker from Naomi Home. It comes in three simple, large pieces, the seat, the seat back, and the sides. To assemble the chair, all you have to do is slide the parts in place. It only takes a few minutes and can be done by a single person, including a pregnant mama who still feels comfortable lifting a few things. Once assembled, it swivels in a 360-degree motion and gently reclines. A footrest pops up to provide support. The entire chair is covered in a smooth, yet plush fabric and the large square design looks beautiful in any nursery. We also really like how large it is. Both moms and dads, no matter their size, can relax comfortably. If you’re looking for a durable, comfortable rocker that’s easy to assemble, this is the one for you. Assembly is easy and takes just a few minutes. The large, square design provides comfort for moms and dads of any size. Swivels and reclines for a full range of motion. Moms have noted the color of the chair isn’t the same as what’s shown in the pictures. If you have a bad back, it is important to find a glider that won’t make your problem worse. 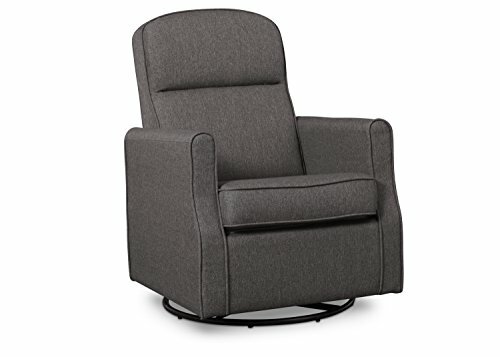 There are many gliders with amazing back support and leg rests that help take the pressure off your problem area and make you more comfortable. If you are searching for a comfortable nursery chair that won’t hurt your back, this one is a good pick. This chair has a firm back, but it also includes a lumbar pillow for added back support. The plush armrests accommodate comfortable feedings to keep both mom and baby content. Sitting in an upright position in a chair can also take a toll on your back, but this chair reclines. The recliner aspect is a no-brainer for parents suffering from a bad back. In addition to the smooth reclining function, there is also a pop-out leg rest and leaning backrest. Not only does this chair offer back support, but it also has the capabilities of swiveling 360-degrees. This chair allows you to have a full range of motion to ensure you can be comfortable at all times. The upholstered polyester is soft, durable, and easy to clean. You can easily spot clean the chair. Smooth gliding capabilities when not reclined. Some buyers said the chair was too firm. Some buyers noted it is hard to recline when holding baby. You don’t want to squeeze into a chair that is just too small or else you aren’t going to be comfortable. A chair made for taller moms typically has a larger back area with more support. This addition can be a game changer. It can be difficult to find a comfortable glider when you are a taller mom, but this one has a higher back that will accommodate most heights. Your head, neck, and shoulders will be fully supported while you support your little one. The arms of the chair are also padded to ensure you are as comfortable as possible whether nursing or simply rocking your baby to sleep. There is also a lumbar support pillow included, which will help prevent possible back discomfort. The soft polyester of the chair makes it feel very comfortable, all while ensuring durability. The durability goes a step further in the construction with the solid wood, and the chair should last far beyond the baby years. The bonus ottoman allows you to extend your legs and become more comfortable fully. This is a great feature when you’re tall because sometimes you can’t quite lean back in a chair and get your desired position. Back and seat cushions are spot cleanable. Includes a lumbar support pillow that can be easily removed. 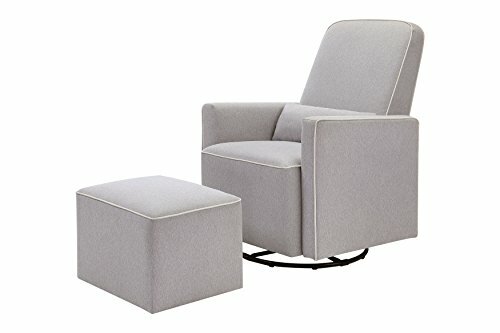 Includes ottoman to improve comfort. Metal, enclosed ball bearings for smooth gliding. Some buyers said this chair is ideal for breastfeeding. Moving parts that could hurt small fingers. Some buyers noted the chair did not last as long as they expected. Some gliders are great until you try to breastfeed your baby in them and are beyond uncomfortable. 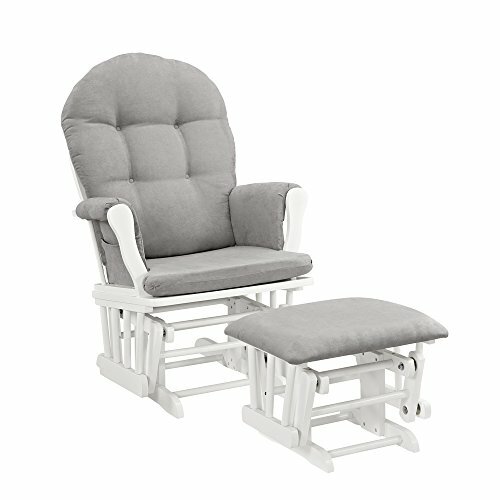 A nursing glider includes special features like wider armrests and extra padding to help keep you comfortable while you nurture your little one. If you are planning to breastfeed, having a great place to do so is vital to any nursery. This glider is perfect because it is designed with breastfeeding mothers in mind. There are key features like the pull-out nursing stool that will help enhance your breastfeeding journey. When you don’t need the nursing stool, it folds right under the ottoman for easy access. The higher than normal armrests are fully padded and designed to help you rest your arms comfortably when nursing your baby. Those late-night feedings can become just a little more comfortable. If you are planning on nursing your little one, this chair is a great asset to make your breastfeeding journey run just a little smoother. This chair can still be utilized by mothers who aren’t breastfeeding. The higher armrests help support your baby when rocking or bottle feeding as well. Ultra plush microfiber cushions to allow maximum comfort when sitting. Nursing stool allows you a supportive base to more easily nurse your baby to sleep. Fully upholstered sides for comfort when nursing. Coordinates perfectly with any other Graco or other branded cribs. Lower weight capacity than other chairs at 250 pounds. Some nursery rockers just don’t have enough room. A plus-size chair not only offers you more room to get comfortable, but they also can offer more room for your little one. If space was an issue with other rockers, a plus-size rocker may be a great solution. If you are looking for a rocker with a little more room, the Nursery Works Sleepytime Rocker is a great choice. This rocker has a wider base that allows the chair to have an overall wider structure. No more having to cram into a chair, now you can enjoy your spacious comfort. The chair is hand upholstered with fine materials that are super soft and designed with your comfort in mind. There are multiple colors you can choose from so you can be sure to find one that will be best suited for your nursery. The wooden supports of this chair allow you to rock back and forth seamlessly while making no noise in the process. 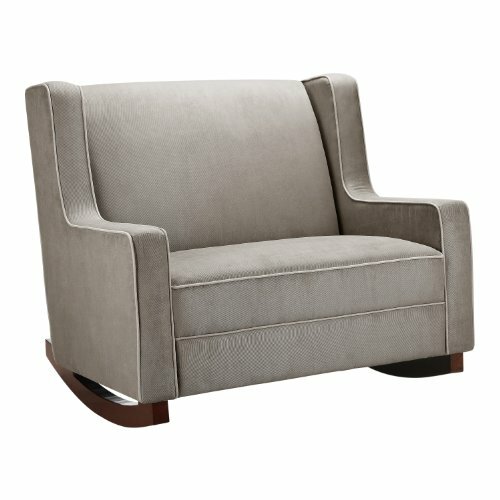 If you are looking for a little larger chair that can still offer support, this might be the chair for you. The simple design will look elegant in any nursery. Composed of durable materials to ensure long-lasting stability. Wider construction for more room. Upholstery is free of chemical flame retardants. Does not glide or recline. Must be cleaned with solvents, foam, or cotton-based cleaners. You might be on the fence about purchasing a glider because you don’t think you have enough room. There are fashionable gliders that were made specifically for small spaces, and it will be the perfect addition to any room. If you want a glider for your nursery, but you don’t have a lot of room, this glider is for you. This glider is designed for smaller spaces, but it is big on function and versatility. The 360-degree swivel allows you to turn any direction you desire. There are three color options available, so you can find one to work with your nursery decor. The colors are simple and not abrupt so they should easily coordinate with any nursery decor you may have. The sturdy composition of this chair will allow it to be long-lasting and durable. Because the chair is designed for small spaces, it is also rather lightweight and easy to move for relocation. The curved silhouette of this chair ensures you will be comfortable, and the thickly padded cushions will even further enhance your comfort. If you love the chair, but prefer a foot rest, there is a matching ottoman available for purchase. Durable steel mechanisms to ensure quiet movements. Whisper quiet gentle glide motion. Some buyers said the material was not very durable. Fashionable moms aren’t going to want to settle for a simple glider. If your baby’s nursery is modern and hip, you need a modern glider. Some parents don’t want to settle with the traditional nursery chair and want a modern adaptation. This glider is the perfect modern piece for any nursery. This piece allows stylish mommas to keep their nursery modern all while not compromising on productivity and safety. Although this chair is modern, it still offers spacious seating in addition to its rounded back. The smooth and gentle gliding offered by this chair will help you get your little one to sleep in no time. The 360-degree swivel motion allows you an extra range of motion to freely move around. 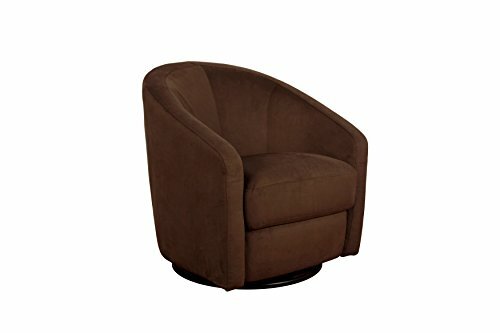 This chair also offers optimal comfort as it is upholstered by hand in ultra-soft microsuede. This chair is perfect for moms who want comfort and style all in one. It doesn’t look the part of a nursery chair so once the baby years are over, it can still double as additional seating in any part of the house. Made with water and stain-resistant materials. Composed of ultra-soft material for maximum comfort. Some buyers questioned the durability. Most parents only have one designated chair that stays in the nursery. You may choose to put a nursery chair in your bedroom if your baby will be co-sleeping, or you could purchase one for your room and the nursery. Having one chair is the necessity and anymore after that comes down to personal preference. Some nursery chairs look the part of typical recliners. You don’t have to purchase a nursery-specific chair, although they will be best suited for your needs. Many of the nursery chairs on the market today can last much longer than your baby-raising years, so you could always find a chair with a double purpose. There are many different kinds of nursery chairs. Whether you are looking for something more traditional or something more modern, there are so many options to choose from. Chairs vary in size, shape, structure, and materials, but most importantly some are gliders, recliners, or rockers. You should keep in mind all these variations when you are searching for a chair because there are so many simple things that may alter your chair preferences. For example, if you are someone who gets hot fairly easily you aren’t going to want a chair that is composed of materials conducive to heat. When looking for a chair, keep in mind what features and movements may be most important to you. Some gliders have been recalled over the years because of their poorly structured frames. You should use extra caution when picking out a gliding chair and ensure it is well put together. You don’t want to collapse in your chair when rocking your baby. You should also keep an eye on any moving parts that are visible and could be easily accessed by little fingers. You don’t want your baby getting injured on a nursery chair. All chairs are made of different materials and some may be harsher than others. You should try to find chairs that are free of all chemical retardants. Always glance over product recalls by the US Consumer Product Safety Commission before purchasing a chair to make sure that yours does not make the list (source). 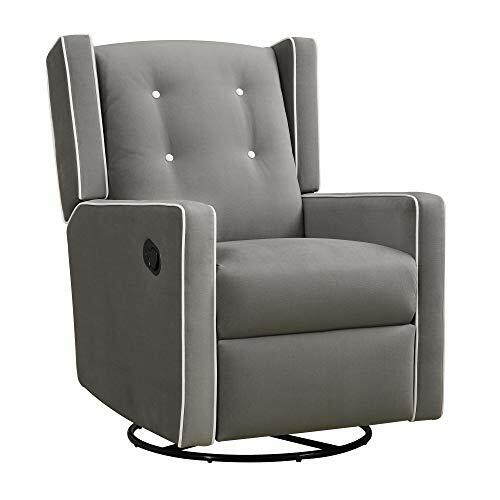 Our top pick for nursery seating is the DaVinci Swivel Glider. This glider is designed to keep mom and baby comfortable when they are using the chair because not only is it designed with super soft materials, but it is also composed of firm padding. This chair can swivel 360-degrees, but is safe for small fingers, and it includes lumbar support to keep mom free of any other additional aches and pains that parenthood may cause. No matter what features you are looking for, your perfect chair is out there. What features are most important to you when choosing a chair for your nursery? Let us know in the comments section below.